This article is a short summary of Mario Kart: Double Dash!!. 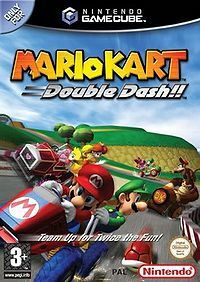 Boxart of Mario Kart: Double Dash!! Mario Kart: Double Dash!! is a racing video game released for the Nintendo GameCube in 2003, and the fourth game in the Mario Kart series. The game featured the new ability to have two racers per kart. Take all the crazy out of the celebrated Mario Kart series... and multiply it by two! In Mario Kart: Double Dash! !, each kart holds two racers that can switch places at any time, so choose from a huge cast of favorites and pair them up any way you see fit! Foes...or friends! In Co-op mode, one player drives while the other punches, kicks, steals items, and helps out with turbo boosts! All-new modes! Race your pals or duke it out in one of three hectic multiplayer battle modes–Balloon Battle, Shine Thief, and Bob-Omb Blast! Items galore! Each character has a unique special item, like a giant Chain Chomp, as well as classic items like homing Red Shells and Mushrooms! Get Connected! Link up Nintendo GameCube systems using Broadband Adapters (sold separately) for wild LAN races and battles! The gameplay of Mario Kart: Double Dash!! differs from the previous Mario Kart games in that the players control two characters in a kart. One character drives the kart while the other uses the items that are picked up, and players can switch the characters at any point while racing. Aside from the standard items that can be picked up by any character, each pair of characters now has their own special item that only they can obtain. For example, Mario and Luigi can use fireballs, Donkey Kong and Diddy Kong can use giant bananas, and Bowser and Bowser Jr. can use a Bowser shell. For the first time in the series, Mario Kart: Double Dash!! support co-operative play; two players can control each of the two characters. In addition, this is one of seven games to support the Nintendo GameCube Broadband Adapter, allowing up to sixteen players to connect together and play simultaneously on up to four consoles. In addition to racing, this game features a battle mode like in the previous games. While the traditional Balloon Battle returns, new modes include Shine Thief, in which players must keep a Shine Sprite until time runs out, and Bob-omb Blast, in which players must hit each other with Bob-ombs a certain number of times. After completing a Time Trial, pressing the button sequence L R L R X Y X Y Z brings up a code consisting of a series of letters and numbers. In Japan, these codes were used as part of a Club Nintendo contest between January 15 to February 1, 2004, in which users would register the code on Club Nintendo's website. The ability to obtain the time trial code was kept for all international releases, though no other region hosted a contest that used the functionality. ↑ Mario Kart Double Dash: The “Lost” Japanese Contest. Source Gaming (May 7, 2015). Retrieved April 1, 2017. This page was last edited on 3 November 2018, at 22:42.